Mutawam another word to add to the list of hard to say but oh so good recipes like sfeeha, kubbeh, makloubeh and kidreh. Mutawam is one of my favorite recipes to prepare with zucchini. 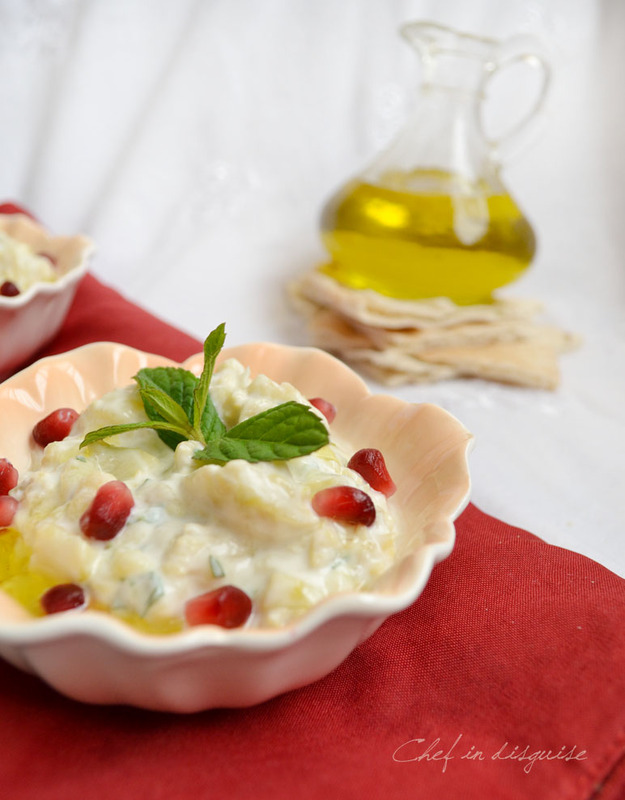 It is one of the famous appetizers in the Levantine countries, often part of the Lebanese mezza along with baba ghannouj, tabouleh and hummous. Don’t let the simple short list of ingredients fool you, the recipe has big flavors. Roasting transforms zucchini, it adds a hint of smoky flavor that pair perfectly with the mint-yogurt-garlic combination. If you have never tried mint with yogurt you are missing out big time! You can make Mutawam up to a couple of days ahead of time and leave it in the fridge. The longer you give it, the more time the flavors have to merge and combine. 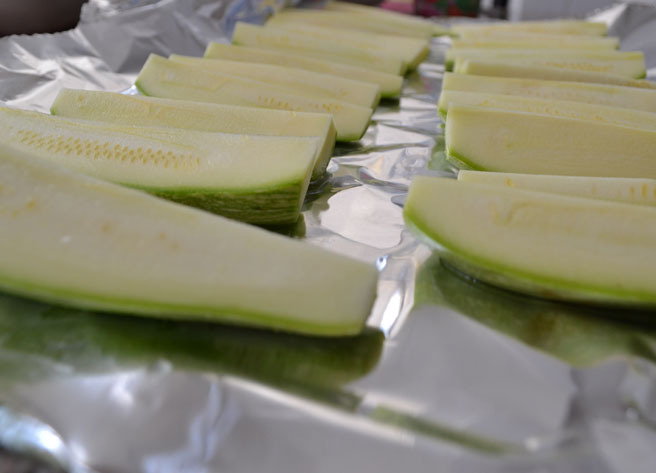 You can roast a big batch of zucchini and store the roasted chopped zucchini in your freezer divided into portions. All you have to do is thaw it and mix it with yogurt, mint and garlic and your dip is ready to serve. Posted in Arabic and middle eastern recipes, Dip, Vegetarian and tagged dip, garlic, lebanese mazza, middle eastern, motawam, yogurt, zucchini. Bookmark the permalink. I have not heard of this dip, Sawsan. I’ll remember to try it when the zucchini comes rolling in in the summer. Wow, I love everything about this dip! Lovely!! I always have a hard time stopping myself from eating too much dip, this one sounds great! Reminds me of baba… not gonna spell it. Looks just wonderful! This sounds wonderful. We’ve probably all made something similar with eggplant, but I, for one, never once thought to roast zucchini for a recipe like this. Thanks! I was at war with zucchini for a long time…. when it was cooked, it was soggy, and it wasn’t very yummy! After an Iraqi friend made this mutawam (she called it mutabbal, though) I love it! 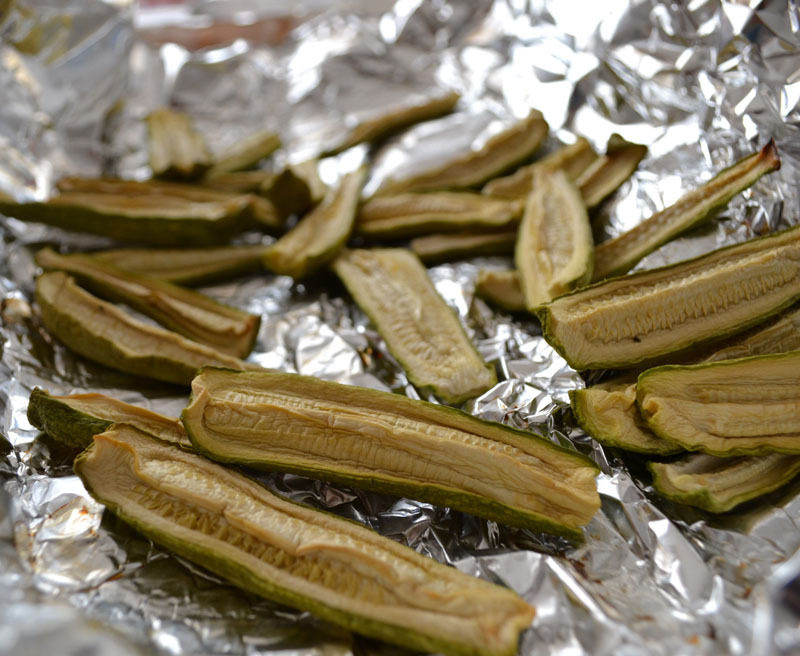 Although I don’t think she roasted her zucchinis, I think she cooked them until they softened a bit…. This is a great recipe for using up the, oh too much, zucchini this coming growing season. Roast a big batch and store in the freezer for future use. What a great idea to roast it and freeze it. We love dips of all sorts and I can’t wait to try this one. This looks delicious Sawsan! I think I’m going to make this for my lunches next week. 🙂 I’ve been making these types of appetizers for the past few months to make my lunches a bit more interesting and healthy. This looks like it will fit right in. 🙂 Thanks! I’ve roasted plenty of vegetables, Sawsan, but somehow zucchini hasn’t been among them. I do love baba ghannouj, though, and bet this will be every bit as enjoyable. Thanks for sharing what I’m sure will be a great recipe! I love this so much and I also love the idea of popping the courgettes into the oven while you are roasting something else. Economical and time saving as well as super tasty! I love baba ghanoush but have never made a roasted zucchini dip, I am picking up my organic veg box today and I hoping for some courgettes now, this sounds delicious!! I love the sound of this. 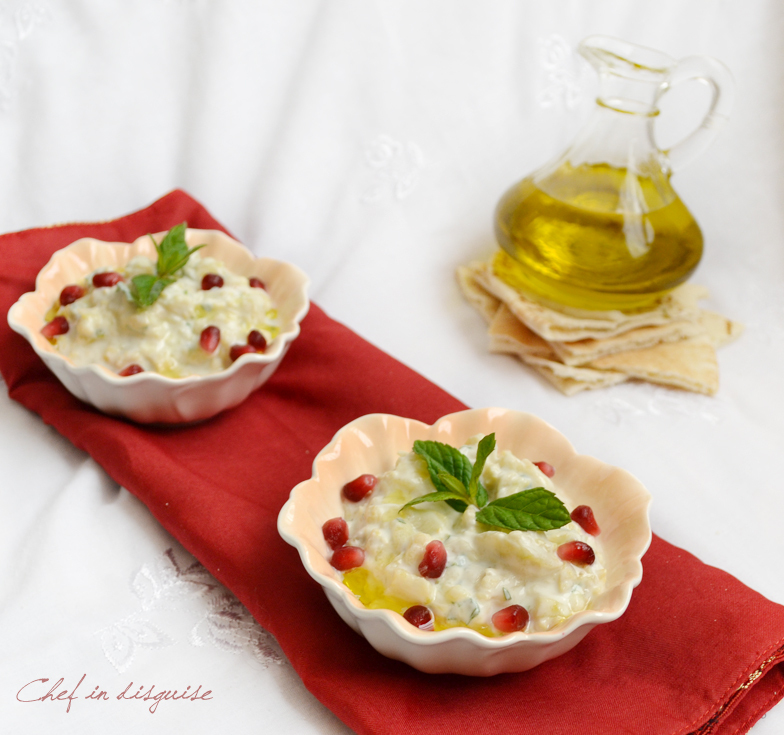 I’ve had baba ghannouj many times but not this with the mint added to it. Perfect! I think this a fabulous dish. What would it be paired with or is it just served with pita? Yummy a new alternative to hummus. And super healthy too, what a great dip recipe, Sawsan. I’m going to try it right away…it’s patio season and I’m always on the lookout for new, tasty and healthy little nibbles for cocktail hour(s). Glad I reminded you of an old favorite. To answer your questions: fresh nana is better iF you can find it but if you can’t I would go with 1/2 to 2/3 teaspoon dried. Quadruple YUM! This looks fantastic and so simple. I LOVE IT! 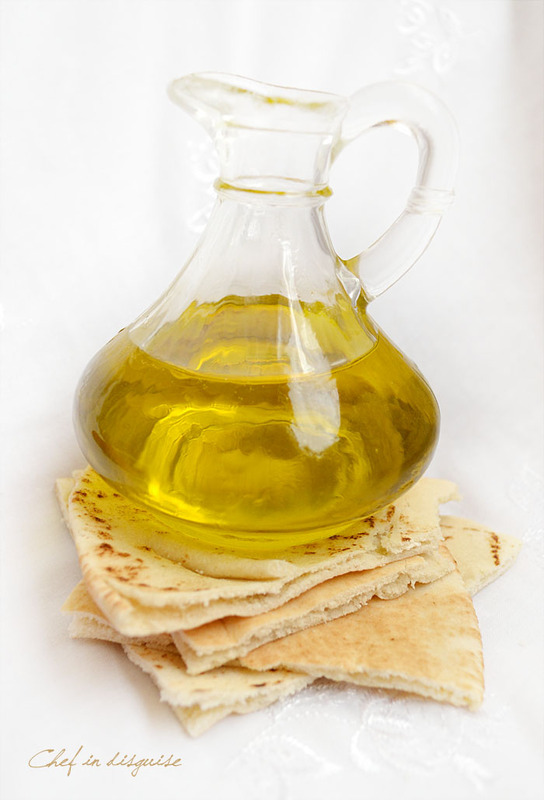 I am really ready to try this ASAP with some good flat bread. I can’t wait to make this wonderful dip, Sawsan. What I love are your notes. I think that since the zucchini can be frozen it will be perfect for summer entertaining. I can roast a lot of zucchini early in the season while it is not too hot. Later in the summer, I can make the dish without heating up the house with a hot oven. I love the ingredients in this dip and would like to make it. I’m wondering if I could peel the zucchini before roasting it to simplify… or does leaving it on help it hold it’s shape or add flavor! It’s so pretty with the pomegranate seeds scattered over top! Hello Smidge, glad you like the recipe. 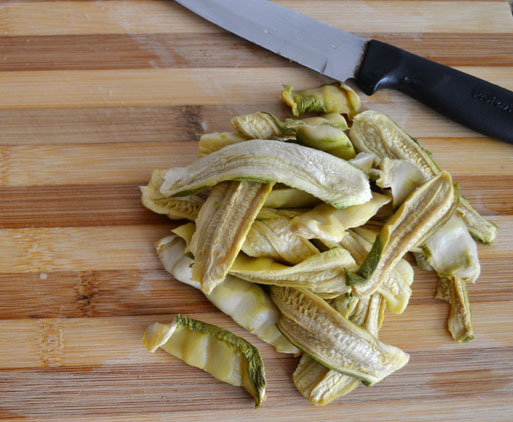 The peel holds the zucchini together,and adds flavor. If you peel it before roasting you won’t get the same result. 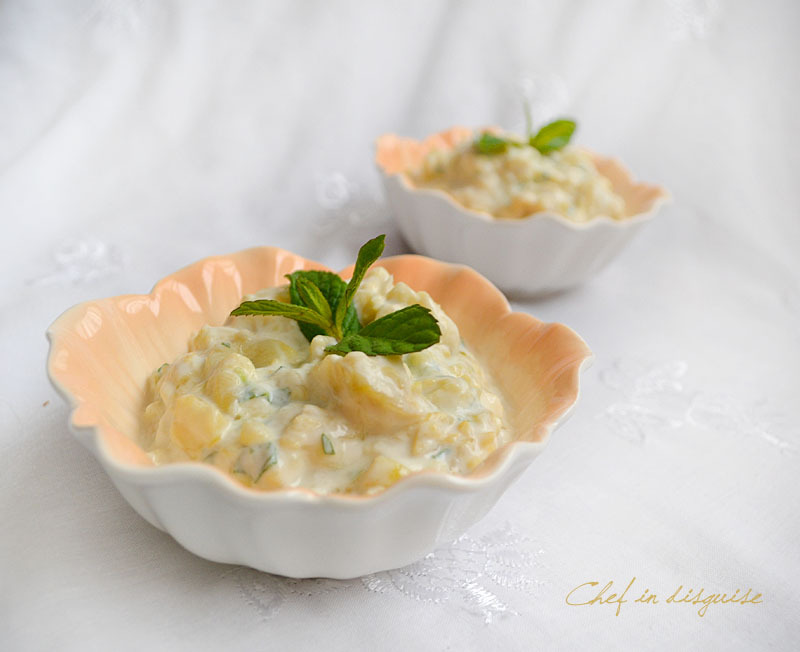 What a fabulous dip, and I bet so flavorful and delicious! Thanks for sharing. Also, I’m having a great giveaway today with four potential prize winners, so you should enter! I’ve roasted zucchini before but never discarded the peel and ate it like that. I do for eggplant, but not zucchini. I learned something new today and I’m excited. This is great way for baby/toddler to eat too (a little too late for me but…). My dip is always very similar and the great part of this recipe is kind of like daily ingredients. I am going to try next time I get pita bread (um store bought unlike yours. =P). Thanks Sawsan! What a wonderful dish, love the mix! You again have taken such beautiful photos. This is something that T and I would both love and cannot wait to give it a try!